Writing about writing and other topics for writing's sake. In the event REMEDY WHEEL does not advance to the final round of the Breakthrough Novel Contest, the free excerpt from my novel and all the warm hearted reviews and comments will disappear like tomorrow is...oh, well, never mind. So for safekeeping I'll post the two official Amazon reviews here. But you should definitely download the excerpt for Kindle and Kindle apps which is free of charge. It is very impressive. The whole setting and the character Haley are well developed and interesting. I would love to read this book or short story. The author seems to have well developed his/her setting, their character and has a strong feeling for where he/she wants to go with the story. I loved it! I feel as though I'm just repeating myself. There were so many little things I liked about this excerpt. Number one: the protagonist was a skinny female who is fighting to get help for her sick father. That touched the heartstrings. Number two: the author touches on a bit of history that has been pretty much neglected. Blacks migrated to Chicago in order to find a better way of life, and yes a lot of them got involved in big churches that had charismatic leaders of dubious ethics. Plus, the author mentioned Mahalia Jackson, a gospel singer whom a lot of people respect. I'm really looking forward to reading the finished novel. 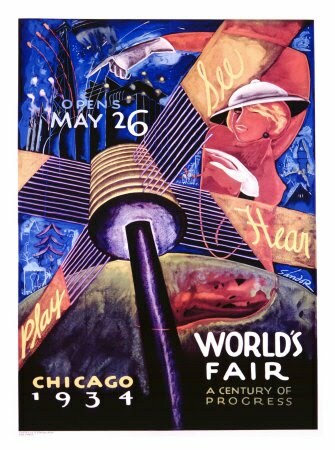 An entertaining part of writing REMEDY WHEEL was discovering all the bizarre, futuristic electronics and vehicles which made their debut during the "big show by the lake," the 1933-34 World's Fair in Chicago. 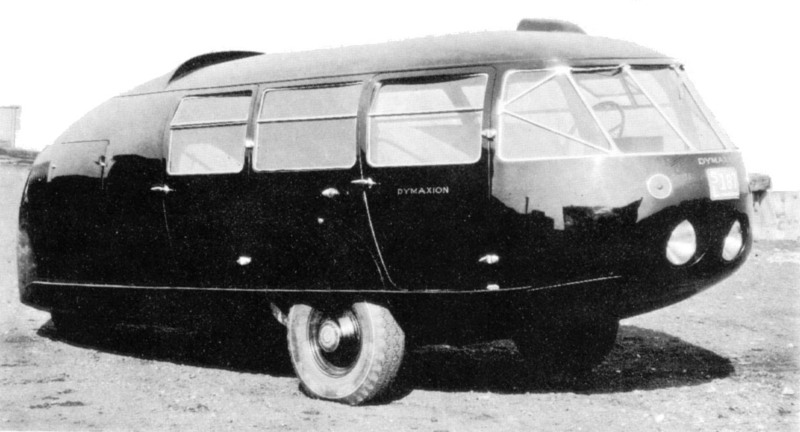 The Dymaxion Car was designed to negotiate the narrow lanes and limited parking areas in newly congested cities. Part of the message of the Fair, of course, was that economic recovery was so assured that soon everyone would have a car, and such problems as parking would become universal. Prosperity was right around the corner. Designed by archietct and inventor Buckminster Fuller, the sleek, bullet car looked much like the airborne "pods" of the Skyride which lifted passengers back and forth above the lagoon, a perch from which they could see four states. 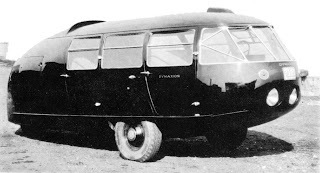 Here's a quick description from Wikipedia: "The Dymaxion car was a three wheeler, steered by a single rear wheel, and could do a U-turn in its own length. However, the rear-wheel steering made the car somewhat counterintuitive to operate, especially in crosswind situations. The body was teardrop-shaped, and naturally aerodynamically efficient. The car was twice as long as a conventional automobile, at 20 feet (6.1 m) long. Drive power was provided by a rear-mounted Ford V8 engine, (See: RF →) which produced 85 brake horsepower (63 kW; 86 PS) through the front wheels. The front axle was also a Ford component, being the rear axle of a contemporary Ford roadster turned upside-down." Even Amelia Earhart, who made a surprise landing in Lake Michigan during the Fair, took a joyride in the Dymaxion. You can see her in the backseat during this video clip. Luckily she wasn't onboard when the Dymaxion suffered a fatal accident during a later exhibition. The prototype flipped over, rolled a few times, and killed the driver. Investors quickly lost interest. Earhart fans should check out my friend Micah Ling's beautiful poetry collection, Three Islands, which revolves around the enigmatic figures of Earhart, Fletcher Christian and Robert Stroud. An unexpected benefit of the Amazon contest is my Goodreads account was upgraded to an author profile, and that allows me to cross post this blog to the blog module there. However, I noticed a problem from the posts I imported, and I'm using this post to see what I can do about it. So though I'll mention another web location I'd like you to visit, namely Amazon's page for the Remedy Wheel Kindle/Kindle app excerpt (free! whee! ), I'll omit the URL because that seemed to cause a problem in the last post. Can't live with that, of course, so troubleshooting will commence presently. For the sake of new content, I'll say that I'm surprised to find myself promoting a Kindle and Kindle app product. E-books and online delivery don't scare me all that much, and I don't know enough about the economics of Big Publishing to understand Amazon's effect on the industry very well. I've tried to focus on writing well, frankly. I'll learn more as needed, but my sense is that content and delivery paradigms will work themselves out and it will look very different than it did ten years ago, unrecognizable from thirty years ago. Some people won't like the change. Others will thrive. Humans will read narrative prose no matter what because that's how we're wired; we're storytellers. We're narrative beings. And people will always buy and keep books--real books, with beautiful covers and crisp pages that smell like your father's office. Just perhaps not in the numbers they did before. My novel REMEDY WHEEL is a semifinalist in Amazon's Breakthrough Novel Contest! Pretty exciting. The big surprise for me was a review by Publishers Weekly, who called the book, "a highly literary tale... a grand old story." You can see the full review on the full editorial review page. The Amazon page I've linked includes a free excerpt of the book for the Kindle and Kindle-based apps, such as for iPhone. Please download (and write a review!) if the spirit moves you. I believe the excerpt they've posted is the first 50 pages of the book. In a month, three finalists will be chosen and then, in June, a winner selected by Amazon customers. I'm still learning how all that works, but the final result is a book deal with Penguin, an outstanding house. "It’s the spring of 1934 in Southside Chicago, a mostly black area hit hard by the Depression, a little before the opening of the World’s Fair. Haley Mitchell, 19, and white, is running numbers for the Kings, a gang too ornery and peculiar for the Capone operation to trouble with. Haley, like every character in this sprawling, highly literary tale, needs a remedy—in Haley’s case, for her possibly brain-dead father. Black store owner Thomas Harris, a strong family man, wants to get out of his neighborhood and away from the Southern blacks, or “migrants,” and move to an all-white enclave near the university, but the most moving scene in the novel portrays the death of his sweet young son, after Thomas has made the move. Sorrow, and muted triumphs take over the novel therafter. Young Oscar Candelero, new to the city, naive and shrewd at once, saves the day. Impressed by the healing ministry of Elder Lucy and seeking the love of Haley, he invents a brand-new game, bringing together both ministry and numbers on the neutral ground—outside Chicago’s jurisdiction—of the Fair. From a souvenir of the 1893 Fair he fashions the remedy wheel, and remedies result, sort of, for everyone. A carefully researched, slow-moving, old-fashioned, and grand old story." Another plug for my reading at West Texas A&M next week. I'll read from my novel in progress and discuss research for this book and for historical fiction in general. 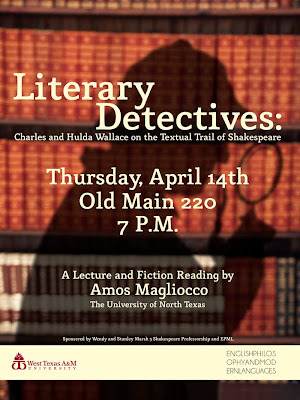 Earlier in the day I'll conduct a fiction workshop for some A&M students. Excited about the trip! If you happen to be in Amarillo next month, come out and say hello! More details to come. Last week's tragic events in Japan, and the ongoing humanitarian and nuclear crises on the islands, underscore our absolute vulnerability and reliance upon our surroundings. This is not a bad thing. This is not a hostile relationship. What I hope can come after is more recasting of the drama not as humankind versus nature, but as human beings integrated within a complex system of earth and air and water, thriving from it and dependent upon it and utterly lacking any power to shield ourselves from our own scientific misadventures. 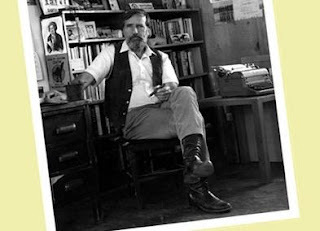 My good friend Lee Martin has a new blog (as well as a Twitter account: @LeeMartinAuthor), and knowing Lee, he'll put real time and effort into both, posting material well worth reading. He's already begun with his first post, on the importance of silence to writing. Lee's new novel, BREAK THE SKIN, will arrive in stores on June 13. I'm posting this mainly so I won't lose track of it myself, but also to spread around this great little cache of Abbey letters published by Orion in their July/August 2006 issue. Glad I caught this! The Missouri Review launched their new online anthology last week, textBOX, a sort of greatest hits collection of fiction, poetry, and essays from the long history of that journal, available in their entirety, which is great news for readers, writers, and teachers all. A lot of great stuff has appeared in those pages since 1978. Also TMR's new main website is live now, too, and incorporates their blog, co-written by several of the editors. This is one of the few writing/publishing blogs I find worth reading. As for my doings, I have my usual course load this spring, four classes total with three of those writing workshops. I have a nonfiction workshop for the first time, as well, which is great, and challenges me to reach beyond the normal copia of answers I use in fiction workshops. While both courses are concerned with story-telling, and there are more similarities than differences, the shift away from an emphasis on scene and new conversations about the nature of "truth" in essay form brings moments when I really have to think about my response. It's exciting. It also jives with the work I'm doing now. Most of my friends know that I'm all-in on the storm chasing memoir at this point. The tentative title is WHEN THE WIND TURNS TRAVELER, (from a Li-Young Lee poem), and essentially covers everything that happened in 2007, but with material from before and after as well. One thing I've discovered already is that my "research" is more or less complete; after fifteen years of chasing I don't have to do much fact-checking. I'm not a writer coming from some distant place to describe storm chasing. I am a storm chaser. The words, happily, appear without much struggle. Of course the subject matter won't be as easy to live with again for such time as it takes to write a book. But what I've come to realize is that while we typically choose our stories, sometimes the stories choose us. "Redivider, a journal of new literature and art, is having its first annual fiction competition, with a submission deadline set for March 1st, 2011. The winner will receive $1000 and publication, second place receives $250 and possible publication, and third place receives $100 and possible publication. The contest deadline is March 1, and full details can be found at www.redividerjournal.org. Redivider is ranked in the top ten literary journals in New England by the Boston Globe, and takes pride in having published renowned authors such as Sherman Alexie, Robert Olen Butler, and Ron Carlson, alongside many promising new voices in fiction, poetry, and nonfiction." That's a nice haul for would-be first place winners. Send them your work! Writer, 2010 Pushcart Prize winner. Recent fiction & essays in Redivider & Isotope. UNT Lecturer. Copy Ed., E-Journal of Severe Storms Meteorology. Stormchaser. “Put on the Petty.” Pushcart Prize 2010: Best of the Small Presses. “The Nine Ideas for a Happier Whole.” The Habit of Art: Best Stories From the Indiana Fiction Workshop, Indiana University Press Fall 2005. "Saturday Children." Redivider, Spring 2011. “Lake Effect.” Yemassee, Fall 2008. “They Never Caught the Sun.” RE:AL, October 2007. “The Nine Ideas for a Happier Whole.” Southwestern American Literature, Spring 2003. “The Sharpest Fall.” (nonfiction) Isotope, Spring 2010.